Sri Lanka, a small tear-drop shaped island country off the coast of India has a population of 20 million, and boasts a diverse range of cultures, languages and religions. The Sinhalese people form the majority of the population; Tamils, who are concentrated in the north and east of the island, form the largest ethnic minority. From Wikipedia, we read, "As a result of its location in the path of major sea routes, Sri Lanka is a strategic naval link between West Asia and South East Asia. It was an important stop on the ancient Silk Road. Sri Lanka has also been a center of the Buddhist religion and culture from ancient times, being the nation where the Buddhist teachings were first written down as well as the oldest continually Buddhist country. This past weekend, Sri Lanka marked the three year anniversary of the ending of its civil war. On this small island, the (Hindu-oriented) Tamil minority ethnic group had fought for a separate homeland from the larger (Buddhist-identified) Sinhalese population for decades, with approximately 100,000 people dying between 1972 and 2009. In the final months of the war - spring 2009, Sri Lanka's military dealt increasingly effective blows, and rather surprisingly crushed the "Tamil Tigers" in a series of final battles in late May of that year, bringing about a total military defeat. The Sri Lankan forces slowly separated and isolated the Tamil Tiger armed forces into a smaller geographic area before finally crushing the armed resistance in dramatic battles May 19 and 20, 2009. Rights groups say up to 40,000 civilians alone died in these final months of vicious fighting, and since the final military victory, the issue has become how to reconcile, how to move forward, how to better address the aspirations of the defeated minority Tamil population, and ultimately stitch together a cohesive society. Building this path of reconciliation between parties and populations is outside the headlines of course, but critical for Sri Lanka's future. And it is a story that many nations have had to tackle, some successfully and others not. We can list a dozen such situations with ease. America's civil war in the 1860s; Russia in the 1910s and 20s; Spain's in the 1930s; Greece in 1950's; India and Pakistan and later Bangladesh in the 1940s and 60s; Nigeria in the 1960s; Liberia, Sierra Leone, and Rwanda in the 1990s; Sudan's in the 1990s and 2000s as well as Somalia's descent into anarchy in the same period. Then there's Yugoslavia, Iraq, Afghanistan, and the latest in Libya and the emerging conflict in Syria. Each has had to deal with, or will face, reconstructing a society with more active leadership, tolerance, addressing grievances, and healing trauma. In Sri Lanka's case, the record has been mixed. A militaristic triumphalism appeals to some and remains a force today, while the harder bridge building and healing efforts continues to be elusive. US Secretary of State Hillary Clinton recently stressed the importance of demilitarizing the northern part of the country and holding provincial elections there, as well as the protection of human rights, including the protection of the press, having the government create space for Sri Lankan civil society, and “generally the creation of an environment that is inclusive.” Sri Lanka's Foreign Minister had last week presented Clinton with “a very serious and comprehensive approach” to the implementation of recommendations from Sri Lanka’s Lessons Learnt and Reconciliation Commission (LLRC), appointed by President Mahinda Rajapaksa in 2011 to investigate and address the issues that led to the 1983–2009 conflict. The meeting occurred because demands for an international tribunal had been called for as critics accused Sri Lanka of foot-dragging on these issues until now. The northern city of Jaffna - the most populous among the Tamil minority - has potential for growth and development. The former Sri Lankan army chief, Sarath Fonseka, who had spent nearly two years in prison after running a failed campaign for president, was freed on Monday. His release came as the Sri Lankan government has been increasingly criticized for trampling on civil liberties and human rights. Sri Lankan television showed General Fonseka leaving prison on Monday afternoon as a jubilant crowd greeted him with firecrackers and cheers. President Mahinda Rajapaksa, who had jailed the general in 2010, signed an order last week pardoning him from serving the remainder of his sentence. Fonseka had in the past three years at times criticized other commanders for aggressive actions against the Tamil's and in any regard had been considered a major rival of the current president. On the other hand, looking at reconciliation from a generational standpoint, there have been more attempts at bridge building. Younger Sri Lankans are more enthusiastic about building a unified society perhaps than those more entrenched in their perspectives. Canada's National Post notes that one of the most promising efforts at reconciliation comes in the form of Sri Lanka Unites, a group that brings young adults from both sides together for conferences and shared activities. This August, the group will hold a leadership conference in the city of Jaffna, in the heart of the war-torn north. It is expected to draw 500 top student leaders, including 50 from the diaspora (of whom 15 will be from Canada). It is believed to be the first national event of any kind to be held in Jaffna since the end of the civil war. A Tamil newspaper reported yesterday that a four-member squad Friday morning attacked the secretary of the Jaffna University Student Union (JUSU) using iron-rods near a Sri Lanka Army camp at Kaladdi in Jaffna. The 25-year-old student leader was on his way to the University in a bicycle to observe Mu’l'livaaykkaal Remembrance. 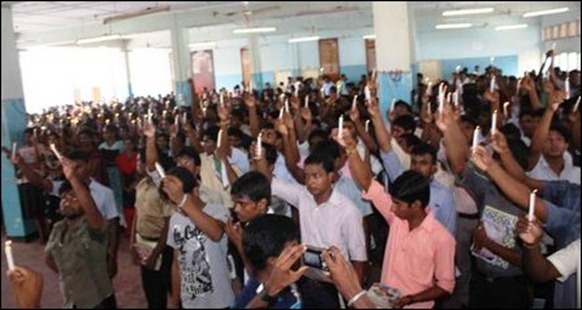 Despite the threats by the Sri Lanka military intelligence, the students of Jaffna University went ahead with the memorial event stating that it was their democratic right to mark the remembrance day and protested against the military operated administration of civil affairs in the peninsula. Tension prevails at the University of Jaffna where students have gathered in thousands. Jaffna University students at a remembrance event commemorating the struggle in the north of the country and a slow pace of reconciliation. The key for Sri Lanka is how the nation will choose to remember their civil war - to acknowledge the issues and tensions and consciously seek to address them for the collective good, or "ignore" or minimize the past, leaving it open for a tragic relapse.